That the influence of the old house was unwholesome, he could not deny; but traces of his early morbid interest still held him there. He argued that the fever alone was responsible for his nightly phantasies, and that when the touch abated he would be free from the monstrous visions. Those visions, however, were of abhorrent vividness and convincingness, and whenever he awaked he retained a vague sense of having undergone much more than he remembered. 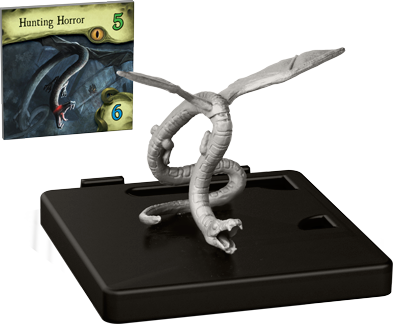 The gameplay of Mansions of Madness Second Edition is modeled after that of the first edition, however the game’s companion app and minor changes to the game system make the experience distinctly different. In the asymmetrical first edition, one player had to take on the Keeper role, controlling the monsters and mythos. In this edition, the app takes over that function, spawning creatures, generating events, and even randomizing the game board to increase the mystery and anticipation of every round. Additionally, because there is no need for a Keeper, Mansions of Madness Second Edition can be played as a single-player game. 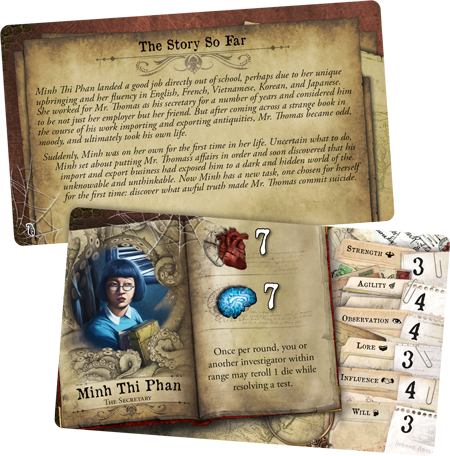 When you sit down to play Mansions of Madness Second Edition, you will select one of the app’s scenarios to play, each with a different story, duration, and difficulty. The selected story will determine both the setting and objective of your mission, however the map, items, and monsters you encounter along the way will vary from game to game. 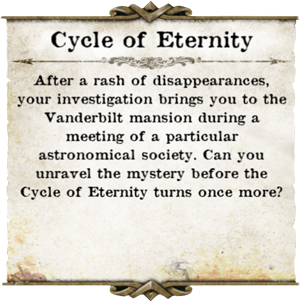 Where an office may lie behind the door at the end of the hallway in your first game of Cycle of Eternity, a sitting room may appear the next time, and a study the time after that. The drawer that once held a brass key may later contain evidence to help you solve a puzzle, and the yard in which you once encountered a pair of chanting Cultists may now be home to a terrifying Deep One. With these ever-changing game elements, you will never play the same game twice; down each hall and behind every door lies another mystery for you to uncover. After selecting the scenario, you and your fellow players will claim investigator identities. Each investigator has a distinctive story, driving their quest for the truth, alongside a unique array of traits, skills, and abilities. Take Minh Thi Phan, for example. A very balanced character, Minh is smart, cautious, and deeply invested in her quest for the truth. Her levels of health and sanity are neither exceptional nor lacking, but allow you to explore all avenues in your investigation. Her exceptional vigilance is also apparent in her special ability, allowing you to reroll one die while resolving a test of her various skills: strength, agility, observation, lore, influence, and will. Each investigators characteristics will be balanced differently, some enabling you to exceed in particular aspects of the game, while perhaps putting yourself at risk in others. After you have selected your chosen scenario and investigators, the app will generate the random elements of your game, including the map, starting items, monsters, and mythos events. You and your fellow investigators can distribute the starting items and spells freely at the start, but you should consider this decision carefully—it will require valuable time to trade later. Once the items have been allocated, you may proceed. The app will quickly and easily guide you through initial set-up and subsequently thrust you into the dark, mysterious night ahead. Mansions of Madness Second Edition is played over a series of rounds, each made up of two distinct and threatening phases. During the Investigator Phase, you and your fellow players will uncover the secrets of Arkham by exploring the shadows, investigating curious objects, solving complex puzzles, and battling fearsome monsters. When all investigators have completed their actions, you will confront the terrifying Mythos phase, comprised of mythos events, monster activations, and horror checks, mercilessly testing your health and sanity. Your primary movements around the board will take place during the Investigator Phase, which allots each player two actions. In order to expand the map and discover its secrets, you can execute move, explore, and search actions. If you are simply traversing between previously revealed locations, moving can be a simple action, but you will likely face a far more arduous task should you attempt to flee a nearby monster or enter a new, undiscovered area. Exploring the map and searching its shadows for clues are equally uncertain, each potentially revealing new spaces, items, or information, while also chancing the appearance of a new monster or challenging puzzle. Utilizing items or interacting with the people and objects around you may also be critical moves, but they may cost you precious time all the same. Your final and most daunting choice of action is to engage with a monster, performing an attack while putting yourself at risk. However, every monster you eliminate will mean one less attack to face come the next phase. Dread will fill you as each Mythos phase begins. Whether you are coming from smooth victory or heartbreaking defeat, there is no respite from the horror that awaits you. Once your Investigator phases are over, you will proceed through three equally torturous stages of the Mythos phase: mythos events, monster activations, and horror checks. The mythos events may affect your chosen investigators, particular areas of the game board, or those who have performed certain actions, testing a variety of skills. Whichever is headed your way, you have no way of knowing, and certainly no way of preventing it. After these events, the monsters will take their opportunity to strike, moving closer to the nearest investigator and attacking with all their might. How much damage you take will depend on how well you resist their vicious assault. Pain and fear are all but inevitable, though you will have to push through their many side effects in order to continue toward your objective. Should you survive the monster attacks, you will endure Horror Checks, the last stage of each Mythos phase. If you are sharp and agile, you may avoid these by staying far away from active opponents. Any investigator within range of a monster, however, may be in danger of taking yet another hit to their health or sanity. The Mythos phase is truly unforgiving. 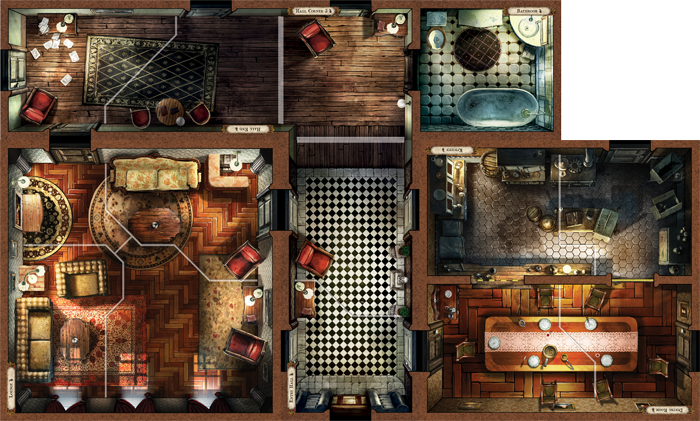 If you are no stranger to the investigations of Mansions of Madness and are still in possession of the investigator minis, monster figures, and map tiles from the first edition of the game, you can incorporate them into the adventures in this edition. 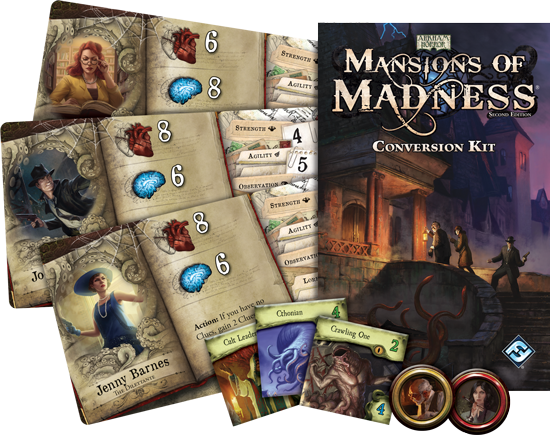 You do not need the conversion kit in order to play Mansions of Madness Second Edition, though its contents combined with the first edition components will greatly expand the possibilities within your game. The terrifying Dunwich Horror, the haunting Cthonian, and fifteen other monsters from the first edition may linger to haunt you in the second. You may also make use of sixteen additional investigators, by pairing the new cards with your existing figures in order to further customize your second edition investigative team. In order to use these first edition components, simply input which items you already have into the app, and the horrors within will haunt and expand your game. The infinite possibilities of Mansions of Madness Second Edition will never fail to terrify you in new and thrilling ways. When you step through the door, you never know what you’ll find on the other side. With your dedicated and unique team of investigators, however, you’re certain to enjoy finding out. Solve puzzles of the mind, fight unrelenting monsters, and discover the truth as you press forward through the cursed halls and alleys of Arkham. There’s no way out…except going through. Mansions of Madness Second Edition is now guided by a companion app that removes the need for a Keeper player, makes for a fully cooperative game, allows for single player gaming, and makes setup quick and easy. Can I combine this with my first edition of Mansions of Madness? 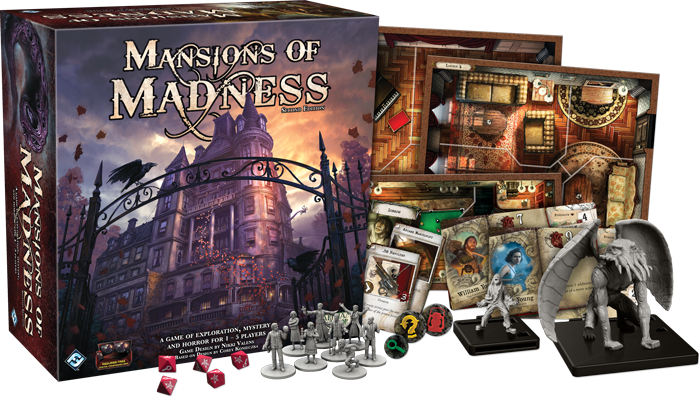 Mansions of Madness Second Edition includes a conversion kit, which is designed to incorporate your first edition Mansions of Madness investigator figures, monster figures, and map tiles into the game. These additional components will significantly expand the app’s choices when generating maps and monsters, as well as the set of investigators from which you can choose. What if I don't have the first edition core and expansion packs? You do not need anything besides Mansions of Madness Second Edition to play the game. However, the investigator figures, monster figures, and map tiles from Mansions of Madness First Edition, Forbidden Alchemy, and Call of the Wild will be available in the Recurring Nightmares and Suppressed Memories Figure and Tile Collections, releasing in Fall 2016. These will also require the conversion kit to incorporate into your Second Edition game. Can I play the game without the app? No. 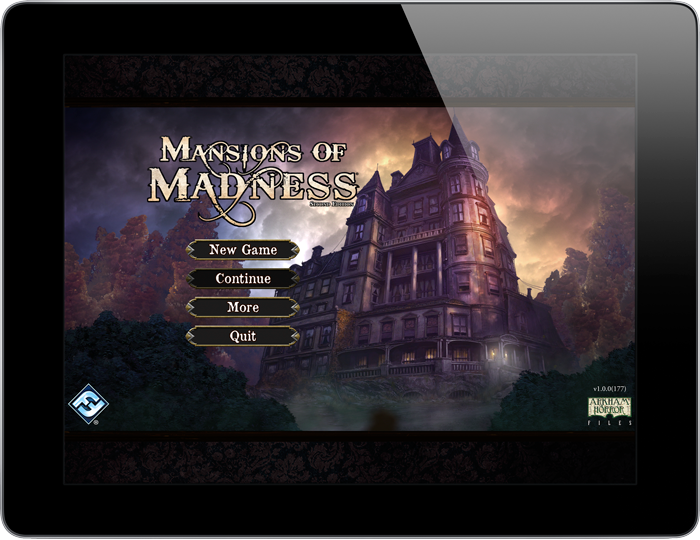 Because the app is an integral part of gameplay, and generates each scenario and all of the game’s tiles and events, you cannot play Mansions of Madness Second Edition without the app. - Fixed a bug in Astral Alchemy that prevented an explore node from being interacted with. - Additional bug fixes for AA, EFI, and GoA. -Fixed a bug in Astral Alchemy that used the same tile twice. •Streets of Arkham, a new physical expansion, is now available! The walls separating your reality from the next are beginning to collapse! Dark Reflections, an all-new DLC scenario, is now available!